Welcome to my 30 Minute Money Methods review. Once again, you've stumbled upon another ‘money making method' and are wondering if it's a scam or if you've finally found one that's legit, right? Well I'll save you some time and tell you straight away.. 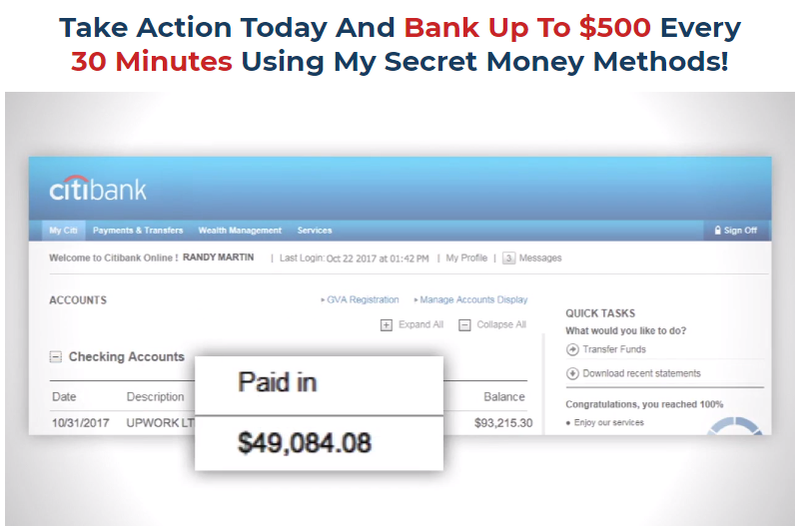 Sorry, but this one, 30 Minute Money Methods, is just another scam. This website is fairly new compared to some others, it was released towards the end of 2017. My first thoughts when landing on this page were.. ‘Here we go again, another scam'. You can just see straight away this one has SCAM written all over it. So, if you watch the video, just like the name suggests, the woman narrating it claims that you can make a lot of money in just 30 minutes. $500 to be exact. With 30 minutes of work, using her ‘secret websites'. My first thought when hearing this was.. Fake. There are no such things as ‘secret websites' that you can all of a sudden start earning $500 every 30 minutes. That's a ridiculous claim. The narrator who calls herself “Shelly West” has a typical sob story again, like many of these other scam websites. She claims that she had no college degree, and she didn’t earn enough money to even feed her two children, so she had to ask her mother to take care of her children while she was trying to make money online. But to no avail. Until.. She came across these ‘secret websites'. Then, suddenly she was earning $10,000 a week! Wow! Amazing! Obviously, this story is completely fabricated. Just like her alias “Shelly West”. If you search for her online, you will find nothing, because she is not a real person. What Are The Money Making Methods? After some digging, I was able to find out what her ‘secret' money making methods are. If you purchase her program, you will get a set of 4 PDF's with training on the secret methods. What are the methods you ask?? Yep. That's it. Those are her secrets. Those are the things that her PDF's will train you to do. These are of course legitimate ways of earning money online. However, they're certainly not secrets, and you certainly won't be earning $500 every 30 minutes or $10,00 a week doing these. The video itself is ridiculous and just it's just a joke. It's filled with lies, false statements and fake stuff in general. 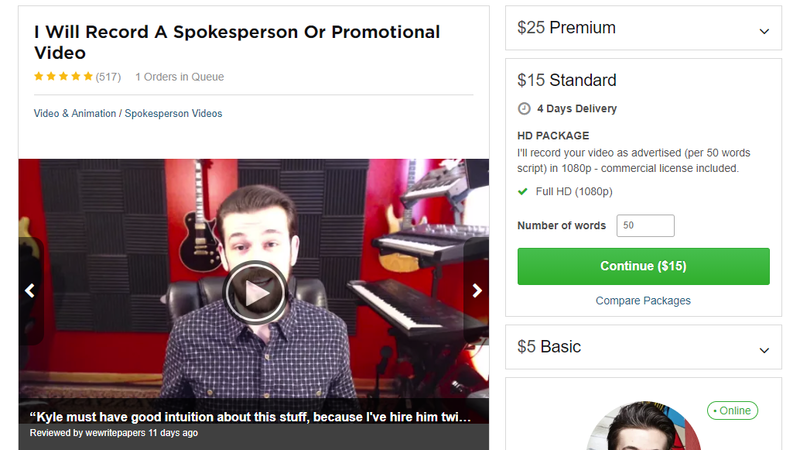 The video is also filled with paid actors that they've found on Fiverr. I don't trust any video that uses paid actors, and neither should you. This just screams SCAM! With all of these fake testimonies. It's clear that 30 Minute Money Methods and ‘Shelly West' are not to be trusted. 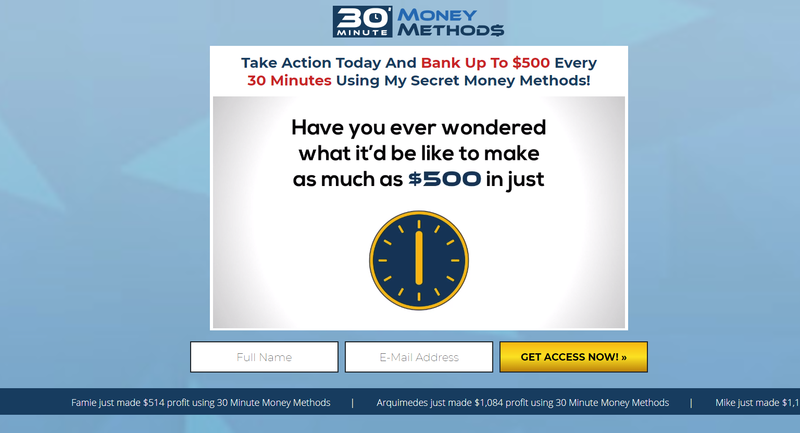 Is 30 Minute Money Methods REALLY a Scam? So, knowing all of this information now. We have to ask ourselves, is 30 Minute Money Methods really a scam? I mean, after all, we are actually getting a product. But, with what we get in those 4 PDF's, there is absolutely no way anyone is going to be able to earn $500 every 30 minutes from it. They even state in their disclaimer that there's no guarantee you're going to earn money. Do I Recommend 30 Minute Money Methods? Simple answer.. NO! 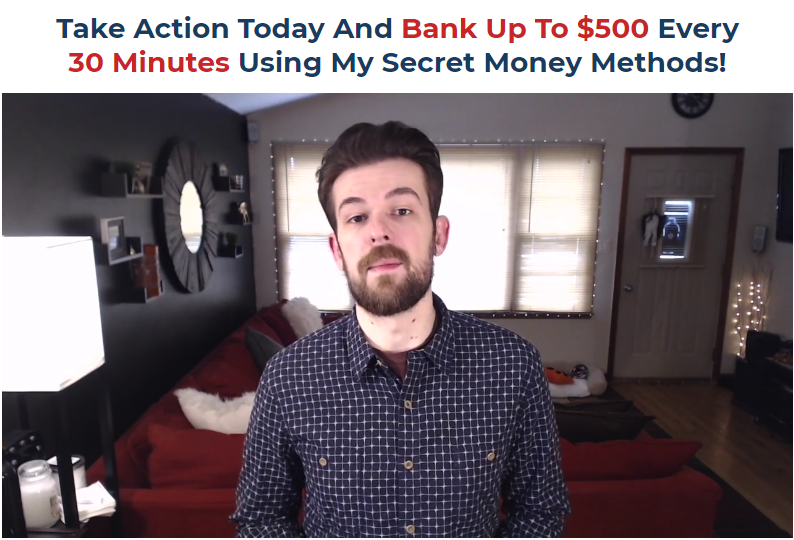 I do not recommend purchasing the 30 Minute Money Methods program. That's is for this 30 Minute Money Methods Review. Thanks for reading! 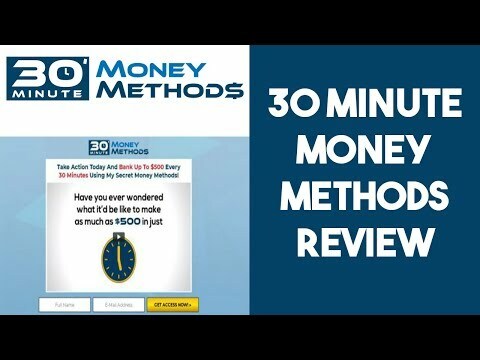 Watch my The 30 Minute Money Methods Review below and subscribe to the YouTube channel.